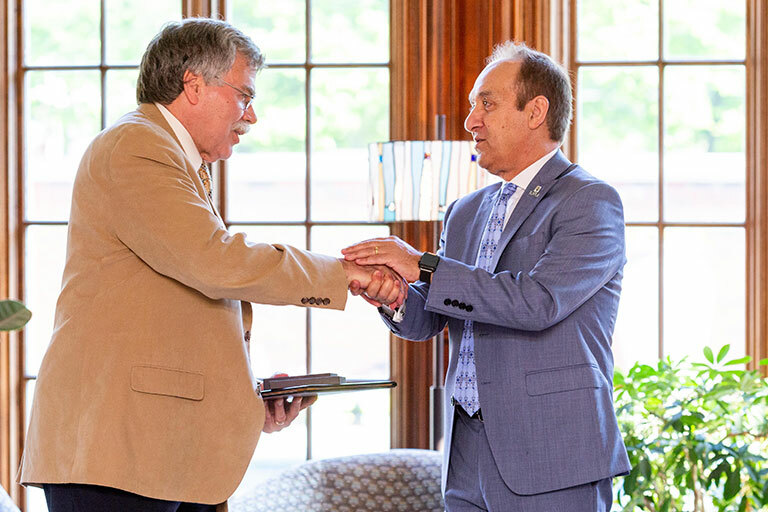 Mike Patchner, Dean of the IU School of Social Work, received the IUPUI Chancellor’s Medallion from Chancellor Nasser H. Paydar at the Dean’s Recognition Reception on May 14, 2018. The award recognizes and honors his leadership and vision, social advocacy, and his contributions to child welfare education, research, and scholarship at IUPUI and beyond. Under Dr. Patchner’s leadership as dean, the School of Social Work saw record student enrollment, grew its faculty by nearly 75 percent, enhanced its academic programs and training initiatives, and expanded its focus to include a global perspective. The School’s strength and growth were reflected in a national ranking for the Master's of Social Work program in U.S. News and World Report in 2008. Dr. Patchner’s contributions to the field of social work expand well beyond the IUPUI campus. In 2004, as chair the Indiana Commission on Abused and Neglected Children and Their Families, Dr. Patchner provided leadership and recommendations that became the foundation for changes made by the state to better protect children in Indiana. In 2010, Dr. Patchner served as the chair of the Commission on Childhood Poverty in Indiana, formed to help resolve the growing problem of children living in poverty. Patchner and the commission were charged with recommending how the state can reduce childhood poverty by 50 percent by 2020. Through this work, Dr. Patchner’s expertise will continue to benefit the citizens of Indianapolis and Indiana.